North Korean leader Kim Jong Un provides guidance with Ri Hong Sop (2nd L) and Hong Sung Mu (R) on a nuclear weapons program in this undated photo released by North Korea's Korean Central News Agency (KCNA) in Pyongyang, Sept. 3, 2017. 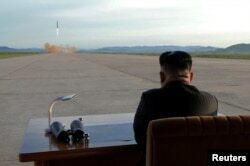 North Korean leader Kim Jong Un watches the launch of a Hwasong-12 missile in this undated photo released by North Korea's Korean Central News Agency, Sept. 16, 2017. 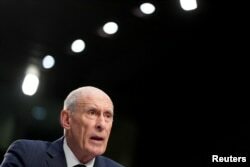 Director of National Intelligence Dan Coats testifies before the Senate Intelligence Committee hearing about worldwide threats, on Capitol Hill, in Washington, Jan. 29, 2019.